Be sure to check out EOC.tv and enter to win some great prizes in their launch contest!! As always I strive to create Eve videos that aren't like other Eve videos and I think this one qualifies. I've never seen anything quite like it before. I didn't know the first thing about Character Animator this morning, although I've obviously worked on animation before. I tried to keep the options simplified, so as not to overly challenge myself the first time out. This is why Rixx's arms don't move. I'll probably keep working on the model and try something even more challenging with it next time. Better to set your sights to something you can accomplish rather than becoming frustrated. From June 2010, a filler page I created for EON Magazine. I miss EON. Do Capsuleers fly their ships alone suspended in their pods? Do they employ small skeleton human crews to man their ships? Do robots, or clones, or some combination of highly advanced technological solutions aid them in their flights? Is the death toll from 30,000 ship losses a day too much for the population of the universe to handle? What is the deal with ship crews in Eve? The truth is, no one really knows. The evidence among the lore is contradictory and often vague in my humble opinion. We know for a fact that NPC ships in New Eden have crews and that the survival rate depends greatly on how those ships are destroyed. We know that ships contain Escape Pods for the crew to use. 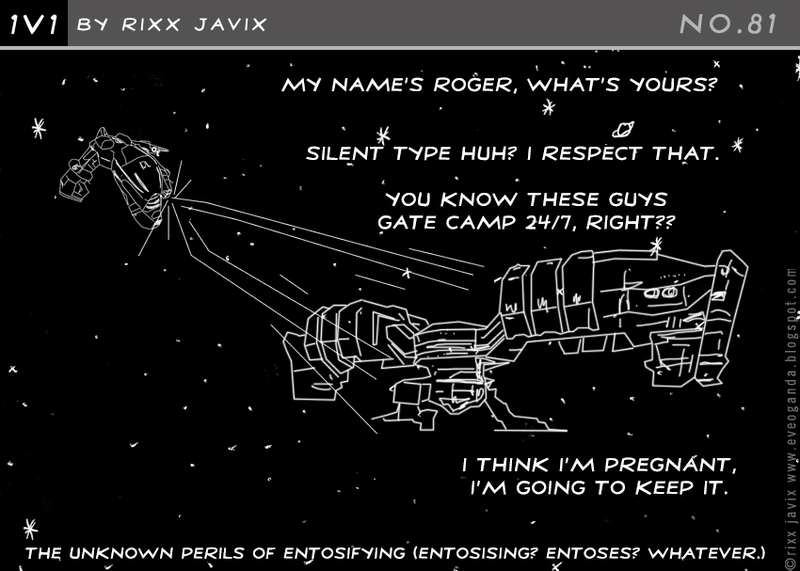 And we know that Capsuleer ships have to contain room for a Pod for us to use. After those "facts" the rest is open to some interpretation. It seems rather likely, based on what information is available, that larger ships do have crew even with one of us immortals driving. The way each of us chooses to deal with the rest of this knowledge seems to break down into clearly defined ways in which we personally choose to deal with Eve itself. There are those that see Eve has a harsh, dark and unforgiving place who choose to believe that their crew dies each time a ship explodes. And the other end of the spectrum chooses to believe that most have a way of surviving the loss of their ship. And then an entire spectrum of faith that lies in-between. Including a wide group that chooses to believe that technology should provide a way to avoid the entire issue. This reminds me of a debate my friends and I had back when Star Trek TNG premiered, and introduced the idea of the Enterprise crew consisting of entire families. What the heck do so many people actually DO on a Starship? A sufficiently advanced culture with AI, holodecks, instant food machines, teleporters, and every thing else - shouldn't need much in the way of crew. So why lug around so many people who are simply going to be put into harms way every episode? For anyone even remotely knowledgeable about science-fiction it isn't difficult to imagine a starship that doesn't even need humans in the first place. Much less hundreds if not thousands of them. So it isn't a huge stretch to imagine a single Capsuleer piloting a Battleship alone floating in their pod goo. It could work. It could be as simple as clouds of nanobots flying around fixing, cleaning, and dealing with the ships needs. Heck, nanobots could just create anything needed from material on-board. Simple and clean, and no need for humans to die. Of course the lore itself seems to indicate humans are involved in some capacity, so these extra-tech concepts are not based on established knowledge. It may be entirely possible that humans NEED work in the world of Eve. With trillions of mouths to feed, perhaps the universe is simply teeming with desperate technicians, mechanics, and astro-navigators hungry for any kind of work. No matter how dangerous it might be. That can also be true. I suggest that the way we imagine the answer to the question of ship crews has more to do with us individually than it does with Eve. I choose to imagine a more romantic version of space travel, one popularized in science-fiction through the ages - of a ship's Captain and his loyal crew. I do so not based on any evidence, but simply because I like that version. It helps to pass the time and I also find it gives Eve more life than the alternatives. When my alt is flying her Providence across 47 jumps, it helps to imagine the passengers and crew and their adventures inside the city-sized behemoth that is that amazing transport ship. It adds and doesn't detract from my experience. I've been enjoying such flights of fancy since I first started playing Eve. You might choose another way. And you may very well enjoy your version of the "truth" just as much as I enjoy mine. We are all correct. Our version of faith, for lack of a better term, is just as valid as any other. Because we take it all on faith when it comes right down to it. Faith in the mechanics of game-play, faith in the history of Eve, and faith in our own imaginations to fill in the cracks and explore this wondrous universe that CCP has gifted us with. In the final analysis I choose to believe that we all have a bit of the truth within us. And, in many ways, I hope that this question never gets answered. The answers I find in my imagination, and in those of my fellow players, are a much more powerful and engaging truth - than any facts could be. Flights of fancy. Isn't that really the heart of Eve? Way back in 2010 I wrote a post called "The Pod Captain Debate" in which I proposed a compromise position regarding the issue of how exactly we pilot our ships. For as long as Eve has been around this debate regarding how we actually fly our ships and how many crew members does it take to make that happen has raged around the community. There are lore experts, there are charts, and there are those that believe we float in our pod and don't need no stinking crew - even in Capital Ships. Look, it doesn't really matter. The game is the game. One could argue, and be right, that we should drop the whole issue and move on. It really doesn't matter in the context of the real world, or in the context of playing Eve. Not even a little bit. I get that. But "letting go" isn't really in the DNA of space nerds, is it? So let us move past the silly logic of being reasonable and try to figure this thing out. 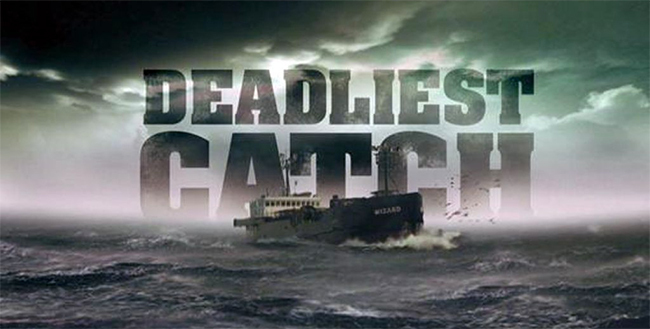 I used an image from the Discovery Channel show "Deadliest Catch" for a reason. Let's assume that of the hundreds of ships going out every day into the Alaskan waters to find crab suddenly have to deal with New Eden levels of danger. An already dangerous job suddenly turns into Eve levels of destruction. In the current scenario that most people cling to, this means that the vast majority of ships going out each day simply do not return. And of those, about 75% of the crew members perish. Now let us imagine the social, political, and economic impact that such devastation would cause around the world. I suggest that rather quickly, people would stop signing up to go out there. In fact, the outcry of such levels of death would be incredible. The entire industry would shut down until we figured out what the heck was happening. If every crew member serving on spaceships in Eve dies, no matter what the specific numbers might be, people would stop serving on ships. Period. People are not stupid. Not that stupid. So what we are left with is two choices. Either the vast majority, like in Alaskan fishing today, survive - or we fly our ships alone in our pods. The lone pod option has problems. For one thing it doesn't address the thousands of NPC ship explosions each and every day. Thousands. There are nearly 30,000 ship losses a day in New Eden on average. I suggest that it is ludicrous to assume a high mortality rate among those ships. I don't care how big the universe is, or how many people there are, no one is signing up to serve in a death trap. 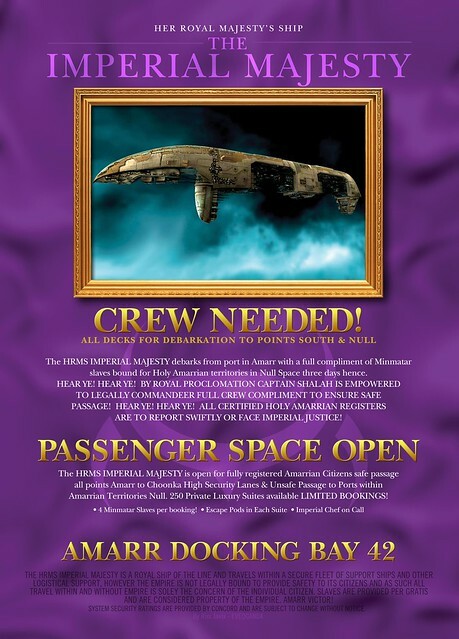 So ships must have crews, even if those numbers are mitigated by a demi-god flying it. And those ships must have a means of increasing the odds of survival for those crews serving on them. A process that is more or less stable, predictable, and reliable. 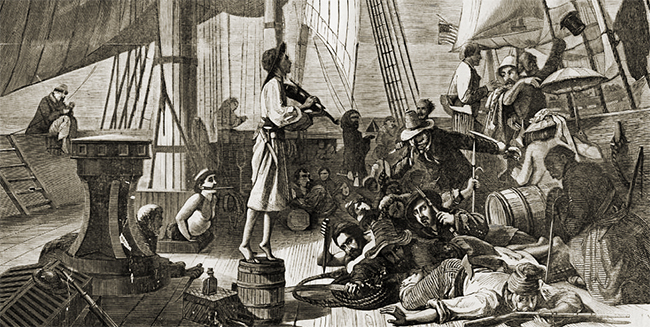 A crew member has to feel they have a good shot at living to serve again, to go home to their family, and be able to spend the money they've made. Just like real people do today. Let me suggest a solution based on perception. As Capsuleers we perceive the universe in a special way, as immortals we are different than the average Joe. This is to be expected. We have a lot to deal with. Information is flowing to us, thru us, and must be dealt with quickly. We don't have time, or the need, to add to that mountain of data. Hence we just ignore those things that do not matter to us. Such as eating, such as shopping for toiletries, and such as the survival of our crew members. We don't have to worry, because it is taken care of. We have more important things to deal with. I believe that even in our pods, we need crew. A small crew of tightly knit men and women that serve with us because of the benefits doing so bring to them. The fame and fortune and social elevation that such duty imparts to their lives. Yes, it is extremely dangerous. And sometimes one of them does not make it back alive. But it is rare. I believe that in the moments before a ship explodes that each crew member has the chance to escape the ship and be jettisoned into space along with us. That such data does not appear on our overviews because why would it? It has no direct impact on our decision making process, we have a pod to get safe. Just like they do. Although theirs is more like the one C3PO and R2D2 use in the opening of Star Wars. At least that is how I choose to imagine it. This is the only solution that makes sense. Space is dangerous, no doubt about it. But it cannot function if it is fatal. Period. In the final analysis it truly doesn't matter. But in my mind, when I am playing Eve, this is how things work. My crew has been with me, for the most part, a very long time. I trust them and they trust me. I've made them, the survivors at least, very very wealthy. And they keep me alive, my ships functioning, and those long hours in space bearable. It is, for all of us, a win-win situation. You can choose to live in a universe where everyone on board a ship dies horribly every time one is lost, or you can choose to imagine the vast majority of them slipping out of danger in their escape pods. For me, I choose to believe the only thing that makes any sense. 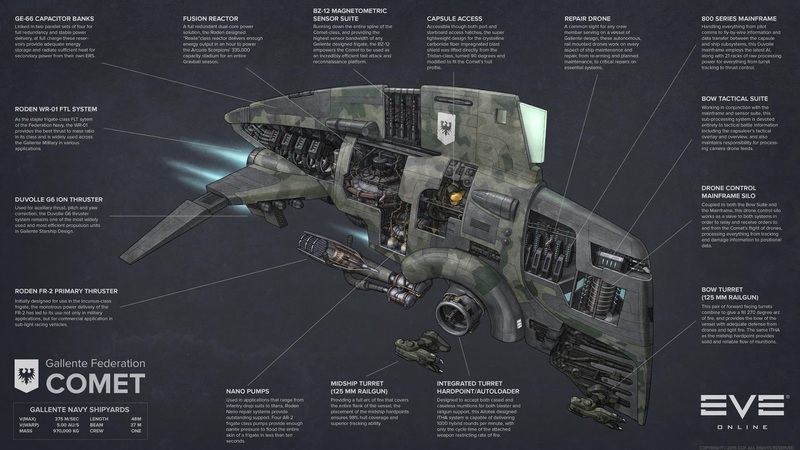 This amazing cut-away of the Fed Navy Comet popped up on Tweetfleet just now. I am a huge space nerd for cut-away schematics, so first of all let me say WOOO-HOOO! 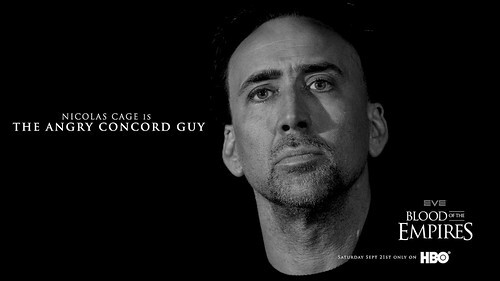 Please more of these in conveniently large poster formats, thank you very much. Nicely done, I like the style choices (please proof-read there is a typo!) and it looks amazing. Well done. I've had a long-term cut-away project in mind based around the "bridge" of the Rifter for the past few years. I have some sketches already done and it is just one of those projects that I never seem to have time to get around to. I notice that this Comet generally avoids the issue of "bridge" and side-steps it a bit with the "Capsule Access" paragraph. The copy is general science-fiction verbiage that doesn't really tell us much, and the drawing is a tad unclear on specifics. I'll go out on a limb here and assume that is the Pod in there. We do know that Comets do come with crew members, so it is unclear where they hang out. Even though this piece says a crew of "one", that may be new doctrine, but it isn't what we've been led to believe up to this point. It is always hard to know what is real lore and what is hearsay. Again, I am overthinking it obviously. But that is what I do. A cut-away invites this sort of debate, it is the entire purpose. Another thing that bothers me is the rail system for the internal drone repair. It seems a tad "steampunk" to me. I'd think a rail system would only limit access to a confined and predictable path. Obviously autonomous and modular repair drones, working together in flocks, skimming along the interior surfaces would be a much better solution. I mean even today we are making great strides with drone flock programming, I just saw a video the other day with a flock of drones building a bridge by themselves. Pretty amazing stuff. Heck, if not clouds of nanobots. This is the future after all. Nit-picking is fun. Don't get me wrong, I love it. I'm a huge fan of the Comet and this just makes me very happy. I want to know more, like what those pipes under the back-end do exactly. And why is the lower front panels exposed? What purpose does the "police" light actually serve? And yes, I spend way to much time thinking about these things. Trust me, I've drawn this ship many times. I know it very well. I hope we get more of these. Let us not kid ourselves, my very first act will be to create the ultimate spaceship with infinite EHP and ludicrous Deeps, with which I shall fly around the universe wrecking untold havoc completely solo and without links! I will do this for several days of carnage and hilarity, during which I shall outline my master plan to all my new found minions. This spaceship will probably look like Serenity to start with. And then maybe it morphs into other iconic science-fiction ships at the push of a button. I dunno, I suppose I would tire of this tomfoolery eventually? Who are we kidding! I would not tire of this until a whole bunch of people on a list somewhere lost their ships!! lolz. Should I be serious now? Ok, fine. I figure this Chair dictatorship is not long for this world, so let's assume I have five days or so before the Icelandic Police show up. So here is my semi-serious five day plan. • WCS now only work on Industrial and Transport ships. Duh. • Jita no longer has a local channel. That should fix that. • Links have to be on grid. Double Duh. • Recons still don't show up on scan... unless they are inside a plex! Muhahaha. • Speaking of plex, we'll add a BC Class plex to make things fun again. • We'd clean house and remove about 35% of the stations in New Eden and have High Sec lose about 25% of its Systems to low sec. Oh and Low Sec gets asteroids made of Unobtanium, which I just invented, which is needed to make T3 Cruisers now. • Let's clean up the database too! Any Corps/Alliance that have been dead for more than, say five years, will be removed from the DB. So someone else can use those names now. • Any ship active on a gate for longer than ten minutes explodes, hmm, same for bubbles. • Entosis links only work on BC/BS class ships. Oh man, here are the Cops. Ok maybe I wasn't that serious, but there are some good ideas in there. And no, my CCP name would not really be CCP Underpants. Although that is a good one. 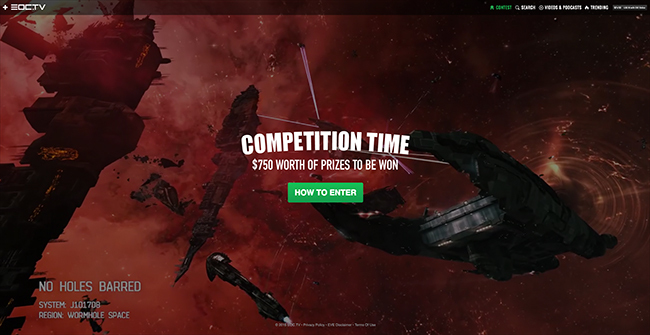 Eve Online Community Television launched today! Now we have a dedicated home for all those incredible, amazing and wonderful Eve videos. So get on over there and enter to win the Launch Competition with some great prizes available. A new thing needs a new wallpaper! A Band Apart has many different Corporations. We of course have Stay Frosty, which is the largest LowSec Pirate Corporation in EvE, and Lucifer's Hammer who is our Industry Wing. There are WormHole Corps., in Supreme Mathematics and New Jovian Exploration Department, both specializing in their own brand of WH Life. And don't forget about Voodoo Children who dabble in a bit of everything, or our new Null Sec based Corporation, the 57th Overlanders Brigade. Every single Corporation in the Alliance adds something new and different, giving us another piece in our journey to build the best Alliance in New Eden. However, we noticed that there was one major thing we were missing. While every single one of our existing Corporations is very welcoming of any player no matter their age or experience level, for some things it just wasn't practical for a truly New Player. The New Player, with no experience in how the game works or functions, and typically low in Skill Points, can only do so much in a more highly specialized Corporation. Vagrant Skies is a Newbie Friendly Corporation whose Core Purpose is to help all of it's Members learn what EvE has to offer, the mechanics and skills necessary to succeed within the game, and to equip them with the knowledge that will help them to be successful on whatever path they choose to pursue within EvE. They are an All-Inclusive group that is dedicated to helping All Players regardless of skill level or play-style find their passion and place within the game. As a Proud Member of A Band Apart they don’t restrict what people can or cannot do. This means that they don't 'require' you to do anything that you don't want to do. They don’t limit you, they actively encourage people to get slightly out of their comfort zone and to try new things! If you are wanting to try something, but aren't sure how to do it, they are here to help you out. Once Members become familiar with the game, discover some new things to do and begin to find what they enjoy doing within EvE, they will be more than welcome to transfer to one of our more specialized Corporations if that's what they'd like to do. They are also VERY welcome to stick with Vagrant Skies as either as a new Mentor, so they can teach other players what they've learned, or just to stay around the new friends they've made in the Corporation, or just to enjoy the laid back, do-what-you-want environment that the Corporation has. No matter their reason, we'd absolutely love to keep them with us! Also, don't forget that just because we are Newbie Focused, we are absolutely welcoming to Vets as well. If you want to learn about a new play-style, wish to impart your hard-learned knowledge onto other players, or just want a place where you won't be judged for what you do in the game or how much-or how little-you are able to play, then Vagrant Skies might just be the place for you! We'd love to hear from you, chat with you, and have you join us in our little venture. You can reach us in our Public Channel, 'Vagrancy Encouraged'. What they aren't saying is how hard they've been working to get this new corporation up and running. Argos and Nix have been at this for months and I'm very excited about the dedication and commitment they've been putting into this. I've wanted a New Player Corporation in ABA since day one, but finding the right people to run such a thing has been a challenge. Luckily, we had those inside of our alliance willing to accept the challenge and not only take it on, but to exceed even my own high expectations. 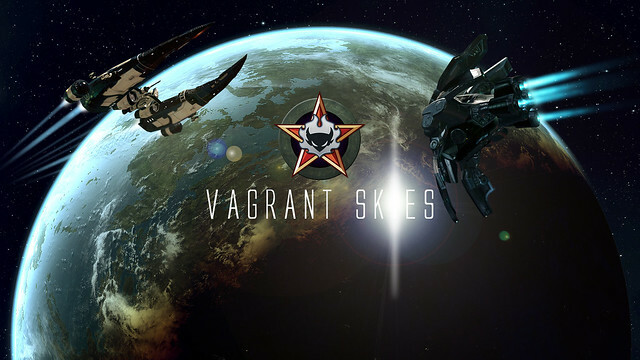 I expect great things from the crew behind Vagrant Skies and I encourage anyone to consider joining the team there. Not only will you get the full attention of the leadership in corp, but you'll also become a member of A Band Apart. Tomorrow, September 21st, will mark seven years since I undocked for the very first time in Todaki and began my journey in Eve Online. I'm struggling a bit with what to say. I've started and deleted several times already. How to encompass all that has happened in those years? Not only in-game but out of game, here in these pages, in the community, and out here in the real world? Maybe, just maybe, it is an impossible task. Perhaps I shouldn't try. I should be clever and find a new approach to help illuminate the impossible. I still remember that very first day. My oldest, who at the time was only fourteen years old, called me to his room to show me something on his computer. The first thing I saw was a Rookie ship floating inside a station, gently rocking back and forth. 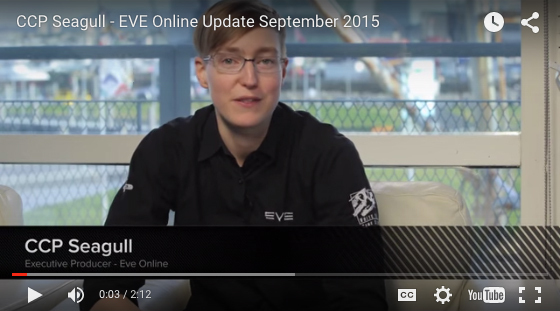 "This is a game called Eve Online, I just signed up for a free trial," he explained. I sat down next to him, "What does it do?" I asked. He proceeded to undock his new Rookie ship and the universe opened up right there on his computer screen. "It's an MMO, thousands of star systems, hundreds of spaceships, you can pretty much do whatever you want." I watched for a few brief moments and then started asking questions. We both did. He had only downloaded it a few moments before. About ten minutes later I knew all I needed to know, it worked on the Mac, the company that made it was based in Iceland (which would give me the inspiration for my character name), and it didn't cost much to play. I raced downstairs to my studio, the same place I'm sitting right now writing these words, and download it myself. 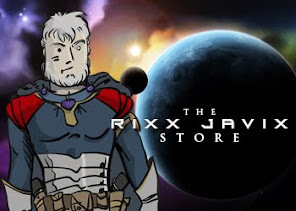 Rixx Javix, named for the Capital of Iceland, was born. I hadn't read anything about Eve before that moment. I was aware of MMOs, but had never played one. I had grown up playing video games, from Pong all the way up on just about every platform imaginable. So gaming wasn't new to me. But I had never seen anything like Eve. From the moment I saw that ship floating in station, I knew it was something I needed to be doing. I had no other plans, or even the merest hint, of anything else when I started. And here I am, seven years later. Eve has seen me thru some devastating and life-changing events. Eve has, in many ways, become an integral part of my every day life. Intertwined in ways I could not have imagined back then on day one. I've traveled to Iceland for Fanfest, my wife plays alongside me now, I'm creating artwork in partnership with CCP, and I've made friends with hundreds perhaps thousands of fellow players in this great community of ours. All of which has happened rather by accident. I never started with any plans, and I certainly never intended for it to become what it has become. All I ever wanted was to play the game, explore the universe, and become as good at it as I could. And yet, here we are. I am Super Fan. I have written millions of words about Eve. I've created hundreds and hundreds, perhaps thousands, of pieces of art based on Eve. Hundreds of Alliance logos, Podcast logos, Banners, Blog Headers, Twitter Hats and Frills, the list goes on and on. And in so doing I have probably talked with and interacted directly with more players from across the vast expanse of Eve than anyone else. I've created and produced over fifteen different player events in-game. My wife and I are planning to start a real world player event next year. We will be going back to Fanfest this year. There is not a region or a place in New Eden that I have not been, except Thera, I still haven't been there. I've been in 16 different Corporations and numerous Alliances. Over two years ago I started a small pirate group called Stay Frosty that has grown to over 200 players strong and founded A Band Apart alliance that currently has nearly 600 players and recently participated in its first Alliance Tournament. Ok, catch my breath time. I promised myself I wouldn't start listing things. It is difficult to write an anniversary post without looking back and wondering over the path you've taken. But where is this all going? I honestly don't know. I have ideas and I have plans, I always do. But I couldn't tell you where things are headed for certain. I'd like to see Stay Frosty and ABA continue to thrive and eventually dominate New Eden in one way or another. Exactly what that means we will have to wait and see. I'm excited about where things are going. Eve is better now than ever, and in many important ways I am too. It might shock you to know that for almost the entire past seven years I've been struggling with severe depression. I lost the business I had started and ran successfully for eleven years back in 2012. I'm still, ten years later, knee deep in one of the worst divorces you can imagine. I'm happily re-married and my wife is incredible, supportive and amazing. She even recently started playing Eve with me. But these past few years have been difficult. Trying to find my way professionally after the loss of my agency has been a struggle. My oldest, who introduced me to Eve seven years ago, ran off and got married instead of going to college. I haven't heard from him in over a year. And there isn't a month that goes by when we don't worry about how we will manage to keep our home. And trust me, that is only the barest of scratches on the surface. But things are turning around little by little. And the future is a little bit brighter. We forge ahead each day with new determination. In all of those challenges, Eve has remained an illuminating bright-spot. A constant in a sea of uncertainty. The place where it doesn't matter, where you can die and try again, fail and succeed all at the same time. Where I find strength and courage and inspiration every single day. 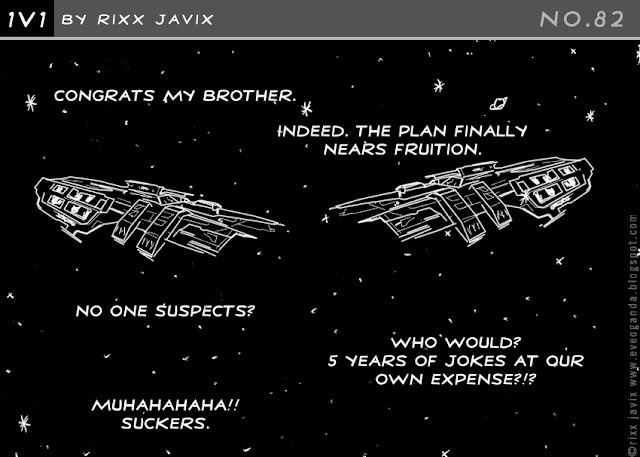 I play Eve, write about Eve, draw pictures about Eve, run corporations and alliances in Eve, and do all the things I do in Eve for survival. Eve keeps me sane. It keeps me away from the abyss, from the edge, and lets me explore life in ways that I could not have dreamed of. And Eve has opened my eyes to new possibilities in ways I could not have imagined. It remains so much more than just a game to me. Seven years into this journey and I can no longer separate Eve from real life. They are one and the same. I feel like an explorer that has been wandering the vast desert for the past seven years, and now I'm rising up into the mountains, looking back briefly to see my tracks far below me in the sand. What a journey that was. But I'm still alive. Still kicking. Still banging my head against some mad bugger's wall. It didn't kill me. PS: Having read over this again, it sounded kind of depressing. I didn't mean for it to come out that way. In fact it isn't, the story is an extremely positive and uplifting one. That is how I intended it. Life is a challenging place to be and I have always pushed hard at boundaries and my own personal limits, both personally and professionally. I took a huge chance once in my career, quit my job and planted my own flag. It went insanely well for over a decade before it fell apart, both personally and professionally. But I wouldn't change a moment. Even though the end turned out to be devastating in many ways, it also burned my former life into ashes. Now I'm just tying to build a new one. And it is going very well, despite the former's annoying habit of trying to kill me. 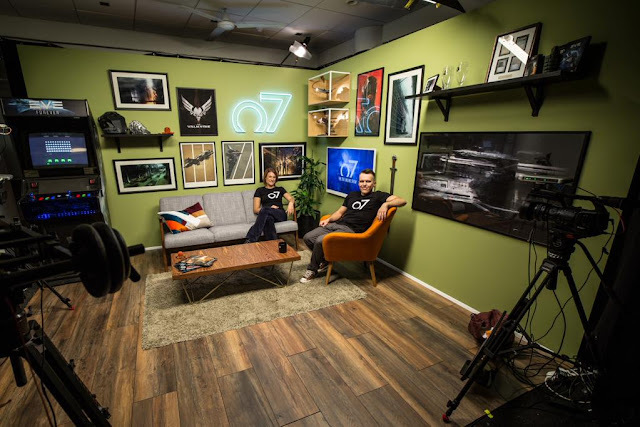 On the o7 Show yesterday and in a blog you can read here, CCP Seagull announced a change in the release schedule that we've become accustomed to. Essentially the same 5-6 week release schedule will continue, but larger and more connected updates will be collected into more formal expansions that will be launched whenever the heck they are ready. In addition Seagull promised to show up more often and talk to us about these things in videos and in more frequent blogs. More Seagull is always a good thing. I was always torn over the rapid schedule of the mini-expansions. The constant iteration and development cycle was a welcome change from the previous quarterly schedule, but it also had its downsides. I believe the implementation of the mini-expansion concept probably had as much to do with internal CCP development changes and new leadership as anything else. And that side of things can't be overlooked. As a sea change, the rapid cycles probably did more to energize CCP than it did the player base. And in so many ways, that has to be counted as a huge success story for Seagull's reign as Executive Producer. On the other hand, the rapid pace made it difficult to wrap your head around changes before new changes were being introduced. I remember a few instances when I was just getting around to being comfortable with something, and then it changed again. And if that is happening to me, I can only imagine it must be worse for other players. The cadence made it difficult for any single expansion to "mean" anything important. All you had to do was wait a bit and it might change under your feet again. It got so rapid fire that we, as a community, began to wonder why they still had names. Who had time to remember their names? And so now we have what we probably should have had to begin with, a more hybrid approach to future releases. The iteration mini-releases will continue but now, every so often, we'll get a more "major" expansion that will introduce bigger and more inter-connected progress. It seems Citadels will be the first of these. I can imagine that Star Gates will be one down the road. Once more this will give players "destination" moments to look forward to and remember. As well as, one would hope, the opportunity for CCP to make hay on them ahead of time. Goodness knows the PR machine could use the opportunity to do so in the media. It would be great to say this is the best of both worlds, and I hope that we can say that down the road. It would appear that this is the right path. Only time will tell. But you can put me down as being on-board and hopeful that this is the right approach. Constant updates and larger progressive releases will help to re-establish some impetus to the expansion model and impact interest in Eve Online moving forward. The new o7 Show set looks great! And you may have noticed two awesome Battlecruiser posters right smack in the middle. The good news is that you can have those and two other ones for your own Eve Cave. 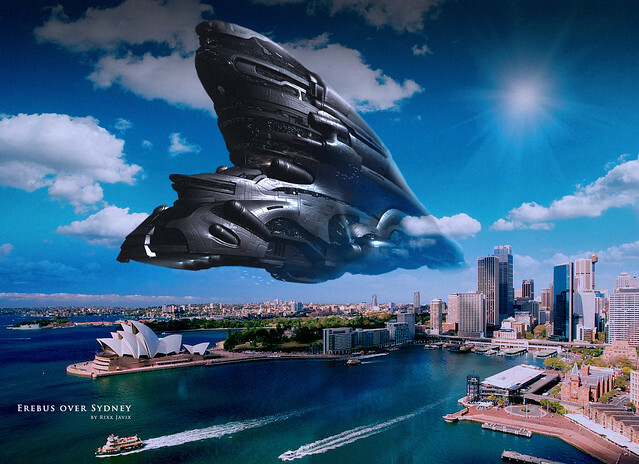 Yep, you can order the complete 4 poster set of Battlecruisers directly from QMx at THIS LINK. 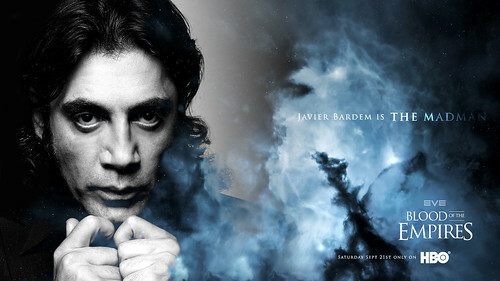 I will also tell you that four new posters are on the way and should be available shortly. The Battlecruisers (which are all getting buffed here shortly by the way!) are going to be joined by four Frigates. One from each race. Stay tuned for information on when they will be available. Very soon™ I promise. Case Study is a new feature I'm trying out where I take an engagement or multiple engagements and walk you thru the entire fight from start to finish. Hopefully this helps illustrate how fights go right and how fights sometimes go wrong. As always I'll pick fights from both sides, those we win and those we lose. As you should all know by now I'm not afraid of admitting my own errors when they happen. Just yesterday I lost a fight simply because my armor repper was not set on auto repeat. I typically check those settings when I undock and sadly I had dc'd on undock and forgot to check when I logged back in. Bad things happen to good people, what can you do? A handful of Stay Frosty pilots are out doing our usual whizzing around the neighborhood looking for trouble, when we spot the Omen on the Okka gate in Reitsato. We had seen some larger gangs rolling around earlier, but all indications seemed to point to the pilot being alone. (Which is never a sure thing.) Either way, we had at least 4-5 ships nearby if we needed them. Mr. Veda had already warped to the Okka gate when we spotted him, so I warped my Tristan to a small plex and started slow boating back towards the Okka gate. The idea was for Mr. Veda to get his attention and then warp in an obvious manner back to me. Hopefully the Omen would follow him. He did and the call went out to our other pilots. Sadly, even though I'd pulled range, the Omen still landed about 40k from me. Mr. Veda's Merlin was behind me about 10k on the gate as we both started burning at him. Luckily 40k is drone range so I went ahead and got my drones going for him. I honestly figured he'd just warp away, but there was only two of us and maybe he'd make a play. The key to surviving this engagement is in the approach. Luckily we both had ABs and not MWDs, so our signatures would remain low, although we'd be slower and less likely to catch him. The critical bit is living long enough to worry about catching him. He let his drones come at us which was a good sign, it meant he was most likely going to play with us. More important to us however was keeping a good transversal line to him and staying oblique to his guns. This is always hard when approaching from a distance, but it is the most important part of the fight. If his guns catch you head on they can hurt or even pop your small frigate. It is a dance, but if you do it right you end up in a very tight orbit with Void loaded and he dies fast. Which is what happened. Our mates arrived, but they got pulled into the gate so they couldn't help us. But we both lived long enough to get in under his guns and then it was just a matter of chewing his relatively thin armor. Once we got in that close we weren't in any real danger, unless we made a mistake. Which we managed to avoid. Omen down to two t1 frigates. Not all fights are about the actual fight, sometimes the more important question is "Should I even take the fight?" And that can often be tricky. There are some things you can do to help yourself make better decisions, if making better decisions is your thing. It isn't always my thing, most times I just go ahead and take the fight anyway. But I am trying to do better. Sorta. Anyway, where was I? Oh, so I'm in a Comet and I spot a Caracal Navy Issue on scan in system. 9 times out of 10 in Low Sec these days a solo Caracal is going to be Rapid Light Missile fit and bad news for frigates. However, first red flag, it is a Caracal Navy Issue which is often a favorite of PvE pilots. Especially alone. Second red flag, he wasn't on scan at a plex, after some d-scanning genius I finally found him at the iHub. That is not the action of a solo PvPer. I'm already in warp when show info brings up the last red flag, the pilot is in a faction warfare corporation. I radio my mates because I figure I have a 50/50 chance he is sporting HAMs or Heavies. Now this doesn't necessarily mean the fight will be easy, a lot will depend on how well fit his ship is and where I land. Never mind, I land right on top of him. Turns out he is sporting ECM and a TD, which makes things messy but not dangerous. That's what drones are for. Granted, he could have run away when his cycle hit, but he didn't. I managed to hold him long enough for the calvary to arrive. My damage application was limited by the ECM and the TD, but once we got multiple points on him he went down fast. There are fights you are doomed to lose from the moment you engage and there is nothing you can do to change that. And there are fights you should win, but for one reason or another (like forgetting to set your armor rep to auto repeat) you don't. But most of the time, all things being equal, the smarter pilot wins the fight. And often the smarter pilot is the one that takes the fight in the first place. 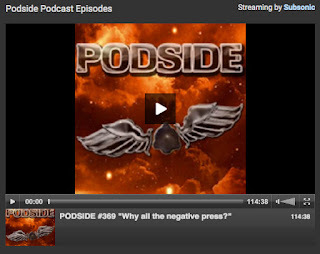 Last night I joined the Podside gang for a discussion about negativity and its impact on Eve and the community. Enjoy! A sea change is defined as a marked transformation of public opinion or policy. A dramatic shift in perceptions that transform previously held beliefs, opinions and attitudes about a subject. We've seen sea change before in Eve. The last one was during the Summer of Incarna, manifested as a riot of anger that shifted the entire world out from under our feet and re-cast the entire direction of Eve. For good or bad, the jury is still out on the long-term implications. While that moment was primarily one of anger, much change sprang from its ashes. We live now in the shadow of that Summer. Sea changes are not always so dramatic. Ask a typesetter. Or ask someone at Borders. You can't because they don't exist anymore. The world shifts often without us even noticing until it is too late. These tectonic shifts can often take years and pass without much comment. At the heart of the last two posts is this question, are we living thru such a shift right now in Eve? I believe it is entirely possible. I have no magic powers of prediction, but it is starting to feel like the world is moving under our feet - and has been for some time now. It would be impossible, and potentially foolish, to point at any specific event and say, "This is it, right here is when it changed!" But taken in aggregate, in the long-view, a multitude of change over time? Well then, such a shift seems far more likely. As I mentioned on the Podside podcast last night, I think we can start pointing at B-R as the beginning of this shift. What it is exactly is open for debate. I'm hopeful that the rise in new player oriented projects, corporations, alliances, and player-based communities is a huge part of this shift. I'm hopeful that the fractured nature of developing null sec mechanics is helping to nudge the player-base out of their comfort zone. I'm hopeful that recent trends towards less subscriptions and concurrent server numbers is simply a natural adjustment to these changes, and not a long-term indicator. I remain hopeful that new players will be attracted to Eve and be willing to give it a try. And that citadels, sov iteration, brain in a box, stargates, and all the other development on the table continues to drive Eve into new and amazing places. But, I must admit, I don't know any of that for a fact. I can keep saying it until I'm blue in the face, but that don't make it so. No one knows that better than me. And so we come full circle to the entire point of these last three posts. No one can know for certain. The naysayers, the prophets of doom, the cheerleaders, the players, the devs, no one can know. All we can know for sure is how we deal with things every day, in-game and out of game. And that is ultimately what will decide the outcome of this tectonic shift. It is in the player's hands. Whatever happens, if Eve is to survive and flourish, the players are the ones that will determine its ultimate fate. This is not a revelation, but I do believe it needs to be said. We are the determining factor, the end-user, the subscription payer, the player on the other side of the screen. What we, collectively, decide is what will push things one way or the other. But that kind of thinking eliminates personal responsibility. And here is where your mileage may vary. Not everyone has a responsibility. Some people are simply players, and there is nothing wrong with that. Nothing at all. It is entirely possible, and I've always believed this, that the VAST majority of players are not caught up in these things. That the vast majority of players log in, play, and log out without much care or mind to greater issues, politics, or tectonic shifts. I doubt that they rarely visit the forums, much less the multitude of side blogs, news sites, podcasts, and other platforms available to them. 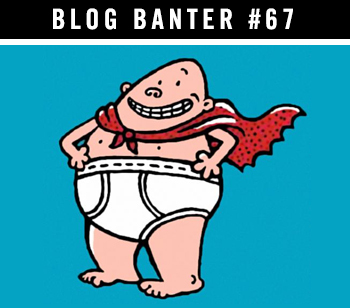 Even with the numbers this blog pulls every day, we are still talking about a tiny fraction of the total player-base. But, in aggregate, words and actions do make a difference. Out here in the real world we call those people "thought leaders", and the Eve community is full of them. In many ways all of us who participate, in one way or another, are the thought leaders of the Eve community. Simply by our participation in that process. And so to us perhaps falls the responsibility of using our platforms wisely. With an eye towards the shifting sands of time and the long-term viability of the very community for which we participate. As for me, I will continue beating the drums. Let's see where this ride takes us, shall we? Obi-Wan said it best, "You have to let go of your bitter and use your feels, Luke." To paraphrase the great Jedi manipulator of innocent third-class young natives in his bloody quest for personal revenge over the deaths of hundreds of young Jedi, not to mention his own teacher and the loss of billions of poor Alderanians, all of whom he was sworn to protect and yet managed to fail miserably to do so. But I digress. Yesterday's post about the negativity that festers in the heart of Eve garnered a lot of attention. Tonight I'll be a guest on a Podcast along with others to discuss the subject even more. Which should be a lot of fun, I'm looking forward to it. We are in un-chartered territory here. Eve is plunging into a new path every day that hasn't been worn down by anyone else. A single-shard shared universe that has been chugging along for a dozen years doesn't come along every day. There are no signposts along the way to judge, reflect, or consider. This is a bold journey that CCP and its players are taking together. Back in 2003 the Iraq War was just getting started and the Space Shuttle Columbia exploded on re-entry. This universe of ours has been chugging along ever since and no one knows how long it will continue. We can all look for analogies in other industries, we can post the subscription or log-in numbers, we can endlessly speculate, debate, deride, argue, blame, point fingers - but what are we trying to accomplish? As fans and players of Eve Online what is our goal? Obviously that goal is different for all of us, that is after all, the wonderful nature of a "community". A community that is united in a singular goal is called a team, and we are not a team. I wouldn't want to be on a team with some of you. And I'm sure you feel the same way about me. So let's stick with community. Most games from 2003 won't even play on your machine. How many games from twelve years ago are you still playing regularly? There isn't much else like Eve. And there isn't another company of people like CCP either. (God bless them one and all.) I can't begin to imagine having to deal with a planet's worth of players each and every day. Balancing game play with the demands of a fan base ravenous for blood. I salute the devs and the artists and the managers and the multitude that keeps this universe chugging along every day. So we ask ourselves then, what is our goal? When I think back I have to consider the fact that much of my own goals and those of our community have been accomplished. Think about this with me for a moment. There was a time when we didn't have a representative group of players that worked directly with CCP. We do now. And whatever you think of the CSM, and opinions vary year to year, you cannot deny the fact that they exist. That is an amazing accomplishment. You also cannot deny that Eve works better now than it ever has before. Or that it looks better now. Or that we have more spaceships. More options. More cool toys. More awesome modules. We have ships that move, that transform, that do things we could only have dreamed about a few short years ago. We have the very beginnings of occupancy based Sov, and while I think we can all agree it has a ways to go yet, it is off to a great start. Soon we will have our own structures, the problems inherent in the POS will be addressed in new and interesting ways. And we've had hints about building our own Gates and potentially exploring new and uncharted lands. We have NPCs that can almost think for themselves! Whew. That's a lot. And that isn't even a comprehensive list. Thing is, I would never in a million years try to tell anyone how to respond to all of that. I respect every individual's right to decide for themselves. All I can tell you is how I respond and what I think. Everyone has to come to their own decisions. Play Eve for a few months, a few years, a decade, or longer, it is up to you to decide. There are plenty of other things to be doing, many (if not most) are more important than internet spaceships. The thing I can tell you is the effect that lingering bitterness has on the community and the long-term prospects of the very game that I enjoy. And this I know for a fact. It has a negative effect. That is a fact. Negativity breeds negativity. Today it is easier than ever to see this happening all around us, the speed, convenience and instant gratification of negativity is showcased daily around the world on our computer screens. And Eve is no different. The hives of negativity might change from one world to the next, but Eve certainly has its fair share of them. So that ball of anger threatens the game I enjoy. It hurts the community I am a part of. And so, naturally, I don't like it. Whenever I get dragged into it I feel despair honestly. And despair is the enemy of enjoyment. I'd rather that ball roll on somewhere else. I'd much rather have good honest debate about real issues, than hurl insults at each other. I'd much rather stand together to improve this amazing game of ours, than fight amongst ourselves. Wouldn't you? Let go of your bitter. Take a break for a moment. Go outside and breath deep. You are alive and that is a gift you will not always have. The internet spaceships will be here when you get back. The old saying says, you reap what you sow. There really aren't many wiser words. There has always existed within Eve a schism between negativity and positivity, between anger and hope, fear and strength. This dynamic has been with us since the beginning. The balance between these two, I loathe to call them "sides", has created and perpetuated a palpable tension that has kept Eve taunt like a fraying string for over a decade. From time to time one side or the other will hold sway. As in the destruction of Walking in Stations for example. The CSM controversies of the past. Recent swings of the BanHammer, or in other multiple instances - one side may temporarily have a stronger voice than the other. This has always served to give Eve a distinctive and recognizable voice in the world of gaming. A voice that has not always served it well. Eve is rather notorious because of it. Spend any amount of time on the Eve Forums or on the Eve Reddit channel and you will find yourself wondering why anyone in their right mind even plays this damn game. It can often be soul-crushing. Why exactly do people who hate Eve and often hate whatever CCP does continue to write and post about it? It is a mystery to me, one that I have no interest in learning more about frankly. I have always tended to avoid the forums, I went almost four years without posting or commenting on them. And I generally avoid Reddit, although I will sometimes (rarely) post something I think would be interesting to a larger audience. Or someone will post something I've written or drawn. I find avoiding those places increases the pleasure I take from playing a game I sincerely love. And one which, I make no apologies for believing, I find to be better now than it has ever been before. But something new is happening. The schism has changed, the tension is different now. It appears as if the introduction of occupancy based mechanics in null space has created a rift. (Which is odd given how vocal the cry for such a system has been since Dominion.) A great divide that is growing stronger every day. If this is so, and it continues to play out in the coming months, then I want to be the voice that says GOOD. If this is finally the moment that the negativity and hate that has often dominated the conversation about Eve finally dies, then I for one will welcome it. It is time. It is way past time. I would like to encourage anyone dominated by a sense of despair, doom, anger, or hate about Eve to please quit playing, posting and commenting. Go on. Feel free to spend your time trolling Xbox Live with the pre-kids. 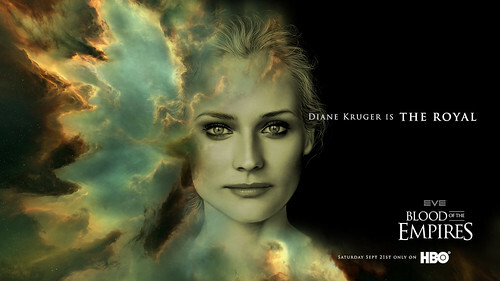 Believe it or not there are those of us that think Eve is better now than it has ever been before. In fact, the overwhelming facts support that conclusion. You and your ilk have accomplished nothing. You have failed. It is time to move on. All that you have done is perpetuate a sense of negativity about our game that has served to limit its growth and expansion. You are, in a very real sense, the self-fulfilling prophets of your own created doom. You've given this amazing, talented and wonderful community a bad name. 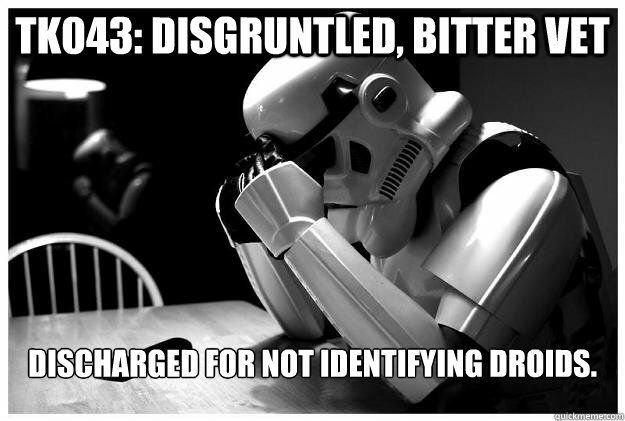 You have discouraged trial. You have kept new players from staying in-game. You have helped to force others from the game. Things are changing. And it would be better for all of us, if you just got out of the way. The great divide is not just about bitter old anger, it is also about the other side of that coin. There is a rising and growing sentiment about Eve that needs more room to grow. A sense of positivity and fun that a lot of us are trying to spread around the universe. There are those of us that strongly believe Eve's best days are ahead of it. And we want to bring more players into that universe. New players, old players, and anyone that would like to play in our sandbox. I know that A Band Apart is only one of many groups that are trying to re-cast Eve in a different light. My good fiend Mynxee's Signal Cartel is yet another. And there are countless more out there fighting to make a stand and provide young players, old players, and players that just want to play, a place to do so. A place that isn't about anger, but about joy and friendship. In fact, almost all of the players that I know are in this camp. As are all those that I have met at CCP. Personally I'd like to see the tide continue to roll in and wash away that bad taste in our mouths. We've all stomached the trolls, the haters, the malcontents long enough frankly. Maybe it is finally time to realize we don't have to. Evil survives only when good people do nothing. Click to image to download various sizes! 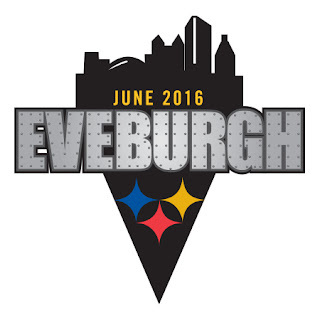 I think we've settled on "Steel City Eve" as the name of our player meet. I spent some time today working on the logo, which is still work in progress. Thanks to Dirk MacGirk for the awesome idea for the tagline! Its only been a few short days and already this thing is starting to feel real. Wish it was tomorrow. Not at all final, early, first try, etc. So this weekend my wife and I had a nutty idea, why not create and host an Eve Player Meet right here in Pittsburgh? We talked about the idea a lot this past weekend and we are committed to making it happen. As usual, I'll be talking about it here in these pages. Not only to promote the actual event, but to also illuminate the thought process and procedures, hurdles, challenges, and updates along the way. Should be an interesting journey. Keep in mind this idea was literally born on Saturday morning in the car on the way to see this thing. Which, due to bad planning on our part, also happened to coincide with the opening game of the Pitt Panthers college football season. So no parking for you!! We decided early on that it should be a way off, it would be extremely difficult to get it up and running between now and Fanfest. And we also thought it would be better to have it in the Summer months, to give more people a chance to work it into their schedules. So we landed on sometime in late June, probably the weekend after Father's Day. But the time and date are still TBD. We have about six or so potential sites that we think would work. We visited two of them ourselves this weekend, mostly because we had never been to those two before. One is in Lawrenceville, which is a great neighborhood down from the Strip District here in Pittsburgh. The location is a newly renovated theater that seats 83, along with a beer room and downstairs bar that (in total) could fit about 120 people in it. The neighborhood is full of bars and great restaurants, so that is also a consideration as well. The other location is in Braddock, which is a bit further away from downtown. Braddock is a town decimated by the decline in the steel industry which is trying very hard to make a come-back. The Brew Gentlemen Pub is an awesome place, but I think the location would make it difficult for our out-of-town guests. At this point the challenge is essentially trying to figure out just how many people to expect? What size crowd do you plan for? If the venue is to small that is a problem, and if it is to large, that is also a problem. Tricky. Luckily we have the time to try and figure some of those things out before we have to commit to a location. I also have some ideas brewing to make the event something unique and special for those attending, but those are in the early stages right now. More about those as they develop. It is a long road until next June (TBD), but we are both excited about the event and look forward to hosting as many Eve players as possible. These are the very early stages right now and we have a long way to go yet, but I think this could be a lot of fun to do. 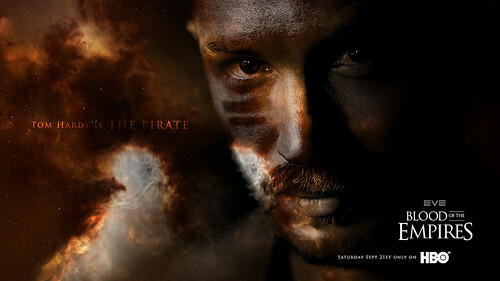 Tom Hardy is The Pirate in HBO's new Eve series! It had been awhile since I pulled the leg of the Eve Community, so yesterday's parody post was extremely well timed. It worked so well that I had people contacting me directly desperately wanting it to be true. Lots of people. Dozens of direct messages. All of us in the Eve Community want something like Blood of the Empires to be true. For the greater world to dip its toe into this virtual universe that we all find so amazingly compelling. It is why we all tweet and re-tweet and link posts that sometimes even just mention Eve Online. It reminds me of Comic Book culture back in the late '80s and early '90s. Every convention I would attend, the same refrains would be heard from fans. When will someone "get it right?" When will Hollywood understand why we all love comics so much and translate that on screen? As we've all seen over the past decade, when it finally started happening, it took the world by storm. And continues to do so. Finally. Eve will never be as big as the DC and Marvel Cinematic Universes, but I do strongly believe that great films or television series are possible based within this universe. Like everyone, I enjoy my Star Wars and Star Trek films, but I also realize how both of those franchises have stifled creativity for other potential science-fiction films with spaceships in them. If it wasn't Star Wars of Star Trek, it wasn't getting made. This choke-hold has been around our throats for decades. Think about how sad that is. The universe is big enough for more. There is one thing we will all have to give up about Eve if it is to make the transition to the screen. I've debated this issue in the past in these pages, but for Eve to work on film the idea of the Capsuleer piloting his ship from INSIDE the goo of a pod will have to change. That idea will have to change to something I proposed years ago. The Pod becomes the Captain's chair essentially, and the small crew has time to also escape. From a story perspective this little alteration of the lore will be essential. In fact, I would argue, that it should be adopted as gospel in-game as well. But I know I'll get a ton of push back on that idea. In my dream series Blood of the Empires I would take a character from each of the four Empires, each involved in a seemingly different storyline, and use them as the main character threads thru which the complexity of the universe and its rich history are revealed. I would try to keep those initial entrance stories as simple and human as possible, slowly revealing the larger themes over the course of the series. Eve is so rich, it would be amazing to work in and thread thru as many connections to that history as possible. But important to not let such richness destroy the essential elements needed to tell a great and compelling story. I would create a completely new and original story not based on any specific player created storyline. Player created stories would certainly play a role in the development, serving as inspiration and the jumping off point for various plot and story threads. But the series should be totally original. The reason for that is simple and based completely around foreknowledge. Something the audience doesn't have but that us players have in droves. It is tricky, but it can be done. Eve stories tend to be about spaceships and not always about people. All of which is pointless. The Eve TV series is over at Scott Free Productions and looking for investors to pull together a pilot. It is already out of our hands. Whatever becomes of it, if anything, will be what it will be. Based on the Halo series they produced, my hopes are not all that high. But, as always, I will hope for the best. Like all of us, I want it to be amazing. Please be amazing. 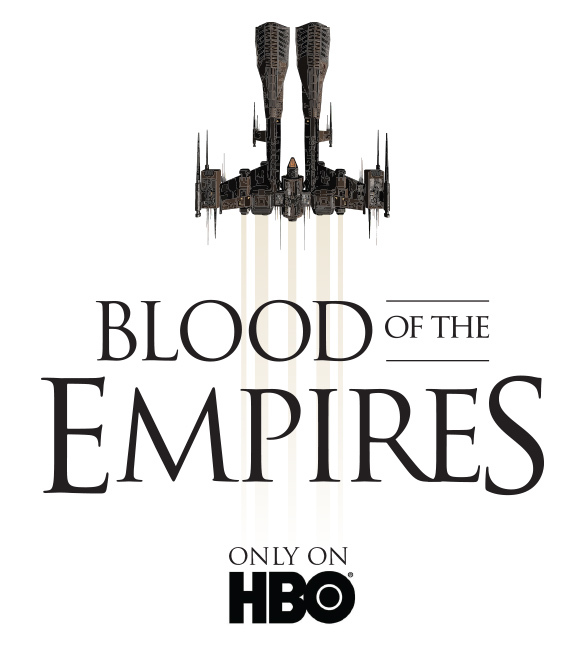 FOR IMMEDIATE RELEASE: HBO, in association with CCP Games and EVEOGANDA Films, is proud to announce the world premiere of BLOOD OF THE EMPIRES on September 21st, 2016 at 9 PM EST. 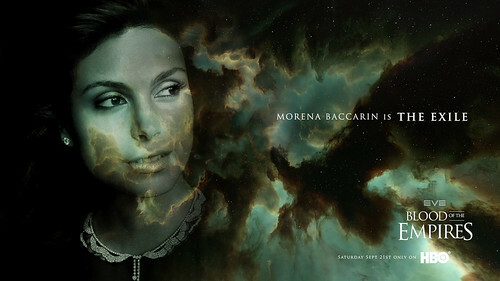 Directed by showrunner Baltasar Kormakur (Everest), Blood of the Empires stars TOM HARDY (Mad Max), NICHOLAS CAGE (Leaving Las Vegas), JAVIER BARDEM (No Country For Old Men), DIANE KRUGER (Inglorious Basterds), and MORENA BACCARIN (Firefly) along with an entire universe of special guest stars, including SCARLETT JOHANSSON as the voice of Aura. Set in the far future of a humanity trapped in another universe, Blood of the Empires is based on the legendary Massively Multi-Player global sensation EVE ONLINE. The series' compelling story is inspired by events created by the legion of Eve players and is set among a galaxy of imagination unlike anything ever brought to screen before. The series primarily follows the destiny of four characters from each of the universes major Empires as their paths lead to conflict and war that will change the face of the galaxy forever, and alter the path of humanity's future. In an unprecedented move, Blood of the Empires is being written by an actual Eve player. Bryan K. Ward, known in the game as notorious Pirate Adventurer Rixx Javix, will be serving as head writer. The series marks his debut as a series writer, but Mr. Ward has also assembled a team of writing consultants including DAN SIMMONS, ERNEST CLINE and HARLAN ELLISON. 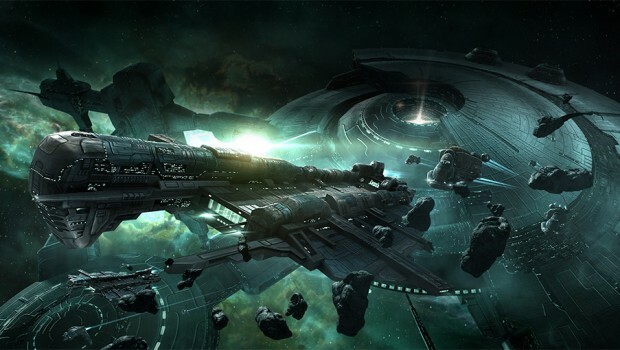 "The primary goal is to tell a story about authentic characters and their personal struggles against an epic backdrop of politics, espionage, pirates, war and intrigue, all the things that make Eve Online so compelling," said Mr. Ward. Blood of the Empires was filmed primarily on location in Iceland, the home of game creators CCP Games and of director Baltasar Kormakur. "Iceland is in the blood of Eve, the harsh reality of the island and its history, the fire, the chaos, it is all part of the darkness we needed to tell this grand tale," he recently told Vanity Fair. Additional location and stage work was also filmed in England and the Canary Islands. Each episode of Blood of the Empires will also feature real Eve players who were lucky enough to be chosen thru an in-game lottery process. 4 lucky winners will be featured in each episode of the series. But Eve is primarily about spaceships and the series will feature hundreds of the iconic vessels in stunning 5k 3D. In another ground-breaking first the series will be streamed live in 3D to Occulus Rift and PS4 Morpheus subscribers. "This was Mr. Ward's idea and I always tend to just go along with whatever he says frankly, the man is pure genius," said CCP Games CEO, Hilmar Veigar Petursson recently. Blood of the Empires has already been renewed for another season. UPDATE: Several early pieces of promotional art have been leaked. Click image if you have the courage! The Truth: Ok I let this sucker run all day and now it is time to come clean. Almost nothing about the above is true. There is a potential Eve television series under development, but details are sparse. What we do know is that Ridley Scott's production company Scott Free has it and that Icelandic Director Baltasar Kormakur is attached. I must caution you however, Scott Free is notorious for having a lot of concepts under development that never see the light of day. If I listed all the projects rumored from the company over the past decade the list would be almost as long as Guillermo Del Toro's. Of course I would love to be involved. Which isn't as big of a stretch as you might think. I have developed two television shows in my history, one of which was going to feature Bret Favre and the other one was actually picked up by the Outdoor Channel - before all the partners has a big fight and fled the scene. I was also in development on a reality tv series about a women custom motorcycle builder and once had a movie script almost green-lighted by MGM - right before they went into bankruptcy. I picked Sept 21st because that is my Eve Anniversary. I thought the casting of Scarlett as the voice of Aura was a nice touch, given her role in the film Her as the voice of the operating system. The rest of it, right up until the quote from Hilmar, is legit ideas I've had previously about bringing Eve to the screen. And while this entire post was a boring Friday's attempt at humor, it doesn't mean the idea doesn't have merit. Which is what makes it ring so true I believe. It sounds really great. I still believe Eve can work as both a series and as a film. I hope that those involved with whatever incarnation eventually sees the light of day feel as strongly as I do. I know they won't, which is where worry starts to creep in. Fingers crossed as always. Tech One Frigates. Cheap, dependable, and capable of greatness. Their loss doesn't sting the wallet like their Pirate or Faction cousins, and yet they can also tackle and solo ships much larger than themselves. Challenge a Frigate against the right opponent and watch the magic happen. We love T1 Frigates for all the potential glory each one represents, the hours and hours of hunting, fine-tuning fits, and hopelessly being caught by those annoyingly linked blobs. So what are the best T1 Frigates in Eve right now? And why. The following list is my personal opinion based on actual combat experience as a daily (Until the AT and Null Sec campaigns at least) undocker and fighterer in them. Feel free to disagree. The key to being a good T1 Frigate in my opinion is versatility. As you'll see from this list, most of the Frigates excel at being versatile. Essentially what versatility boils down to is unpredictability and the capacity to fit multiple versions that each fill a certain and distinct role. The Merlin is a good example of this verisimilitude in action. Blaster fitted with tank, mwd fitted with rails, dual webs, the Merlin can be legit fitted in a number of ways that allow it some options when it comes to engagements. The Amarr only get one T1 Frigate on this list because, while they are all fun to fly, they simply can't measure up to the top tier Frigates. Mostly this is a result of inherent capacitor issues and even the Tormentor must deal with those. But despite that, this plucky little ship has also benefitted from the recent meta-changes around Beam Lasers. These changes have, once again, given the ship versatility in fittings and options when it comes time to engage. The Tormentor is slow for a Frigate, but it can take a lot of damage for its class. It is fitting that the Incursus lands squarely in the middle of this list, because this standard bearer is the epitome of the middle-ground. No matter how you decide to fit your Incursus the potential tank is always going to be the foundation around which this ship excels in combat. Blasters or rails, and that one solitary drone, the Incursus' abilities revolve around its defensive capabilities. Which can often be extraordinary and legendary. The Breacher is probably the least versatile Frigate on this list, but what it lacks in variety it more than makes up for in sheer power. Depending on your fit the Breacher can reach amazing heights in applied damage mixed with a rather potent burst tank. ASBs and recent changes to rocket applications have benefitted the Breacher and made it one of the best Frigates in Eve for combat. The most versatile T1 Frigate in Eve right now, the Tristan combines everything into one little package. Based around a solid drone bay, the Tristan can choose its engagement window better than any other Frigate. This choice means that no matter how you fit it, and there are a multitude of choices from blasters, rails, and neuts, it is usually the one dictating the engagement. And as any combat pilot will tell you, that is almost always the first key to victory in any fight. The Atron, awesome and unexpected damage application built around speed and a light tank. The Slasher, another example of speed and potential engagement window dominance. The Kestrel, not as versatile as it used to be but still a good choice for combat. The Maulus, unexpected and a viable counter-fit candidate that can surprise you. The Crucifier or the Executioner, I really can't decide between these two. Both are good choices but they each also suffer a bit in certain areas. Every ship in Eve fills a role. And sometimes those specific roles make a ship a potent and dedicated opponent. For T1 Frigates it is important not only to be strong, well fitted, and flown with ability - it is often just as important to be able to surprise your enemy. This is why I appreciate versatility in my choices of Frigates. Predictability might work for larger or more expensive ships, but cheap T1 Frigates need an extra edge. What do you think of this list and what Frigates do you rely on for the win? You can find all 81 equally horrible 1v1 Comics HERE. After a week of preparing and taking and timing and effort in our first 'major' effort to take and secure Sov under the new "Fozzie Sov" rules of engagement, I thought it would be worthwhile to express some of my own thoughts about it. First a quick piece of background for those that think of me as a friendly neighborhood pirate haunting the space lanes of Low Security Space. I did spend three years in zero space, fighting in wars, taking and losing a lot of Dominion Space, and spending countless hours firing Torps at objects that didn't move. I've been in Eve long enough to remember setting up a POS so that we had enough of them in System to keep Sov, which was pre-Dominion. With the introduction of the new rules this Summer, groups like ours could finally start to consider zero space as more than a monthly roaming ground for easy bling kills. Did it make sense to even consider the possibility of taking some ground for ourselves? These were important questions, especially for my Alliance, as our entire Mission Statement revolves around providing every play-style in Eve to our members. So we started dipping our toes in here and there. We quickly took Sov in various places, learned how to Entosis, how the timers worked and didn't work, how to find the Command Nodes, and most of the details regarding the way things work. These were only the testing grounds. So we started opening up the Diplo channels and waiting for a good opportunity to present itself, which it did rather quickly during the Alliance Tournament. We decided now was the time to up the testing to another level, and instead of just playing around with timers, actually take and hold some space for as long as we could. The idea here is to see what happens, do we have the numbers, the interest, and the capacity to not only take space - but more important - to hold onto it? In the process we all learned a lot about the new system. And while I can easily attest to the fact that it is far superior in every way to the old system, it is not without its weirdness and oddities. For those of us that are new to the ways of Fozzie, it can be rather complicated and intimidating. Which is not to say that is a problem, Eve is not for the weak of heart. It is a complicated and intimidating game, and taking someone else's space should not be easy. That doesn't mean that some of the most critical features need to be hidden from you either. Just yesterday I learned that iHubs are for more than warping to and catching FW ships to explode. Those things actually open! Who knew? In that spirit of learning new things, here are a few suggestions, issues and problems that I've noticed over the past week that could really help things in my humble opinion. There is no functionality for transferring Sov from one entity to the next. Someone has some space they don't want and you have to come in and go thru the entire ritual of Entosising everything, waiting for timers, and the subsequent mess that goes along with it. This seems weird. In Eve I can give just about anyone anything I want, why can't I just give them my Sov? For a price, for free, for whatever I might have negotiated up-front. It seems like yet another opportunity for game-play in the player's hands. There is a very small window in which you need to set the timers for your newly won system and this function is incredibly important for your defense. So, go ahead, try to find where you do that. Go on. In my humble opinion the functionality of Sov Mangement needs ONE goddamn window, not four or five cleverly hidden windows. It all makes sense eventually, but man is that learning curve rather steep and obtuse. It isn't natural and it can cause some serious grief. It would be rather nice to have a single Sov Management Control Panel. I wrote an entire post about what happened once we took control of our Capital System and everyone ended up stuck on the docking platform, that was just silly. You shouldn't have to dock and undock over and over again in order to see the button to manage the station. And while that might have been an instance, or lag, it still doesn't make the process of finding that control panel any easier. I had to Google it. One point of some confusion for us comes from the "next" systems. We are having a difficult time figuring out what benefit taking any additional Sov brings our Alliance. I'd like to point you to a Reddit post from my friend Kaal Kedrum, Constellation Mechanism - Solving the WHY of Aegis-Sov. I pretty much agree with everything he says in this post. We've expended a sizable chunk of effort and resources on securing our Capital and the returns on that are rather obvious, but what about the other systems? Why take them in the first place? And, even more importantly, why defend them? Our adventure continues. But all in all I think the new Sov mechanics show tremendous potential, both from a sandbox and play-style perspective. They offer the chance for players that might not have considered zero space previously, a chance to try something new and expand their horizons. It should only be the beginning.